Sometimes life takes over. I am going through such a busy time after my holidays. Today I cleaned my desk at work while transferring some of the jobs I have done last year on a teleconference. I ended up throwing away most of the papers I have collected over years. Today we vastly rely on digital data. I can't imagine how it would be to clean a desk in a company after working there for ten years in 1990s. It must have been almost like moving a house. I came home with just two small boxes. I hope your week is more relaxed than mine. 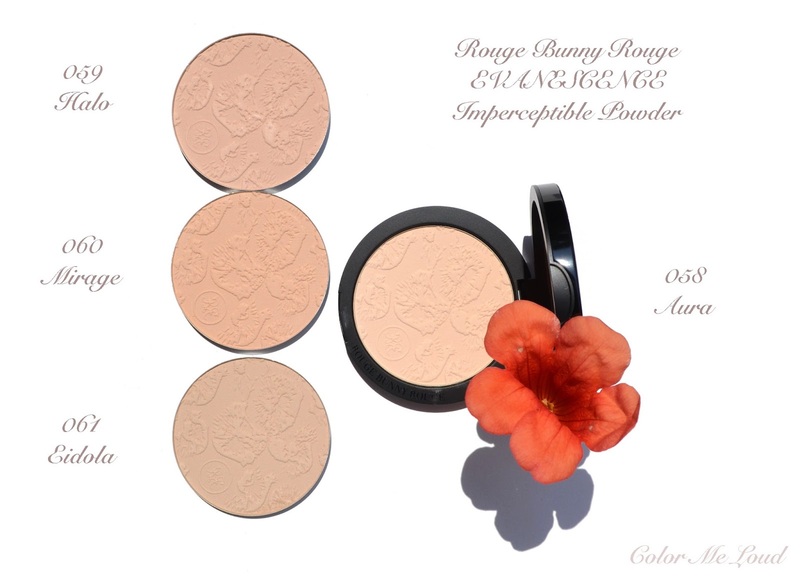 There is no doubt that Rouge Bunny Rouge stepped up the "powder" game. 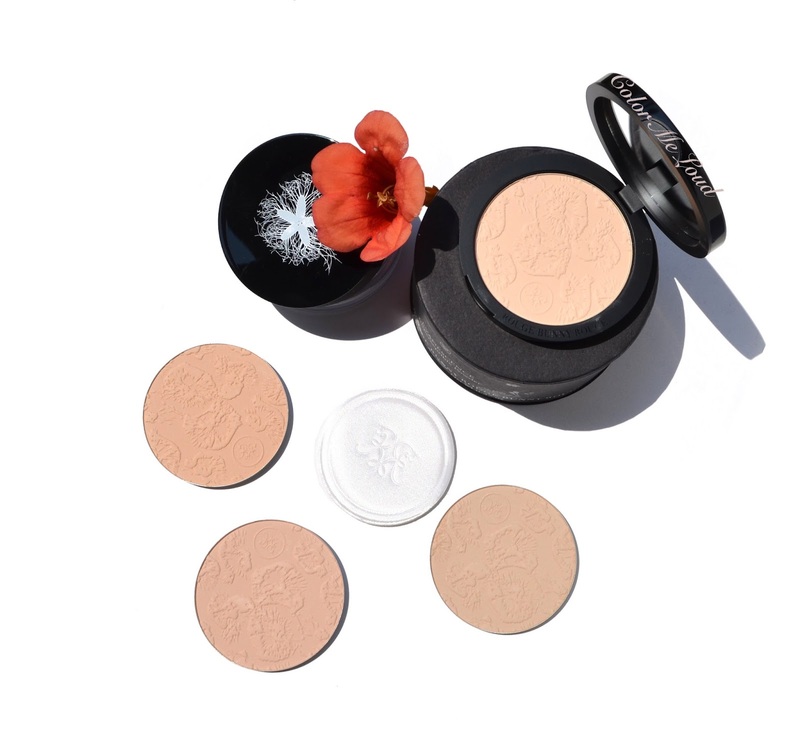 I have been testing the recently released compact powders the brand, Evanescence Imperceptible Powder, for a few weeks now. I took these with me to holidays and ended up wearing with minimal make-up for special evenings. I would like to share my thoughts on those as well as one of my all time favorite loose finishing powders, Diaphonous. I have been meaning to write about it for so long. Now I think I am ready after finishing one up and starting with a second one. When it is Rouge Bunny Rouge we are talking about, it is always about super pretty packaging. 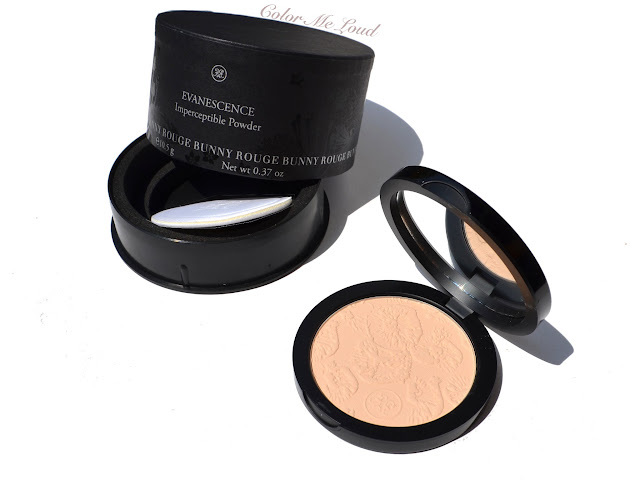 Rouge Bunny Rouge Evanescence Imperceptible Powders come in a cylinder sturdy box which has a touch of vintage feel to it but the minimalistic black design of the box and the compact inside makes it look classical and timeless. Inside the box there is the compact and one white puff to apply it. I personally like applying my powder with a face brush to get a sheerer coverage but if you like to pack on more powder, this is useful. Compact is a black plastic which has a luxurious feel. Closure is magnetic (yes!) and it opens and closes effortlessly. The puff which comes inside the box fits inside the compact perfectly for applying on the go. The powder has lovely embossment on the surface which doesn't go away by the first use but stays intact for sometime. Mine is half way gone after the 6th use. 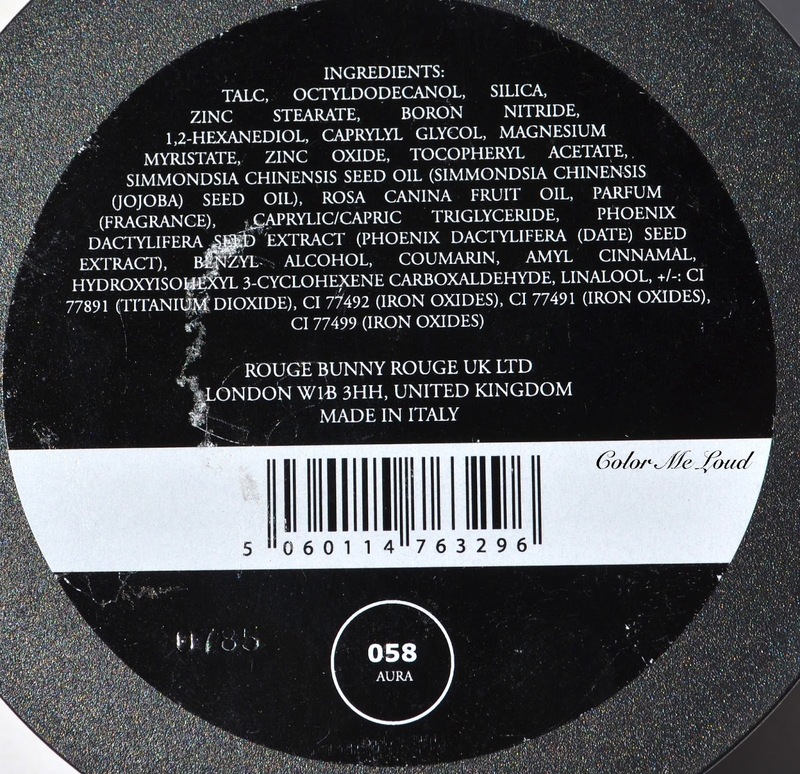 Rouge Bunny Rouge Evanescence Imperceptible Powders are made in Italy and they contain a generous amount of 10.5 g /0.37 Oz of product. 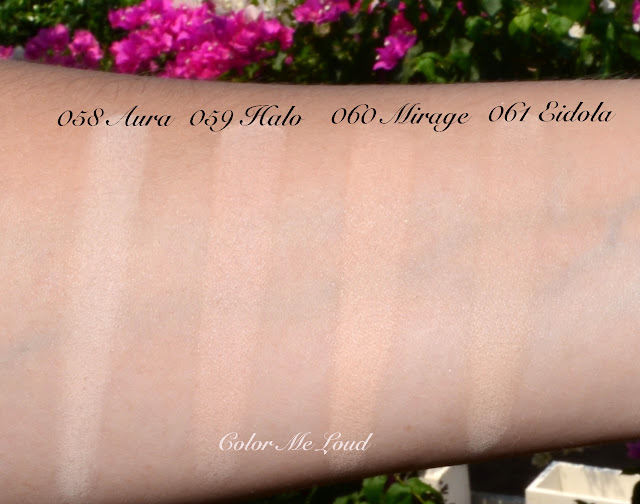 058 Aura is the lightest shade of all four. If you are very fair of if you would like to highlight some parts of your face, you can look into this one. It is the one with the "white" base. 059 Halo is the one with the "pink"undertone. If you have a light/medium complexion with cool undertones, this is the one of you. 060 Mirage is your choice if you have "peachy" undertones. 061 Eidola is close to Mirage and Halo in intensity but it has natural undertones. If you are natural to warm, light to medium, I recommend you getting Eidola. Although in the pan it appears deeper, I would define Mirage, Halo and Eidola have the same deepness. 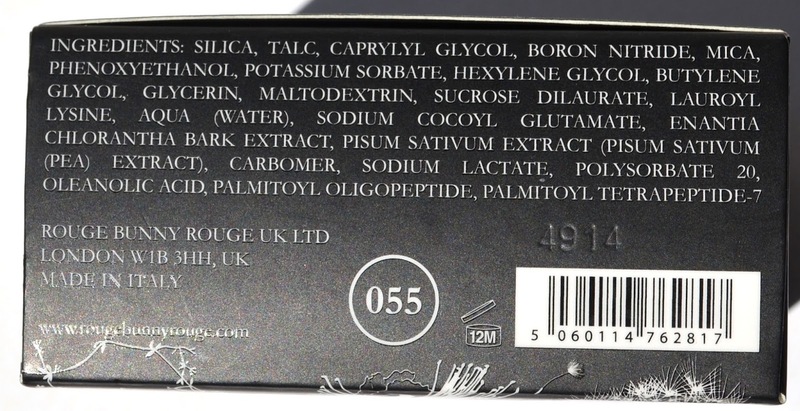 The ingredient list shows, similar to Diaphanous Impalpable Finishing Powder, this is also silica based. Although there is no sunscreen claim of this product, Zinc Oxide may provide some protection. Talc and Boron Nitride has absorbent quality for combination complexions but it doesn't look heavy nor too much even packed on on my normal to dry skin. There is fragrance and alcohol in these powders in case you are extra sensitive. These didn't irritate my skin and the perfume is not very strong. I can only smell it when I put my nose in the powder, literally. Rouge Bunny Rouge Diaphanous Impalpable Finishing Powder, which was released last year is the queen of the loose finishing powders. It is very light weight and almost non existing on the skin although it sets the cream products underneath with a magic touch. 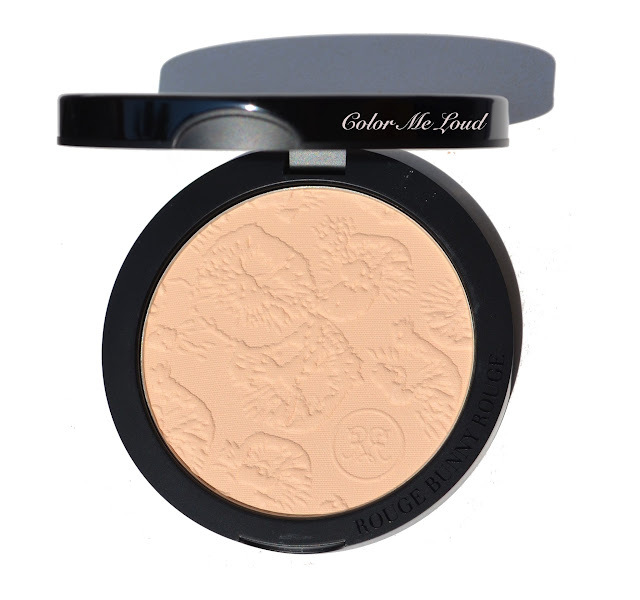 I love it all around the face but if you are going for a dewy finish and want no powder at all you can apply a small amount under the eyes and around the nose (girls with glasses unite) or over the concealer. On my "not very powder friendly" normal to dry skin, this is a blessing but at the same time I have heard combinations folks loving it as well. It looks like magic in a box. Diaphanous Impalpable Finishing Powder is also silica based. Diaphanous doesn't have a particular smell. I am also not brave enough to smell this very finely milled loose powder. It would get into the smallest area of my lungs, whatever they are called ;-) Diaphanous has a slight cooling effect on the skin, feels like a feather and looks like nothing. I am so addicted. 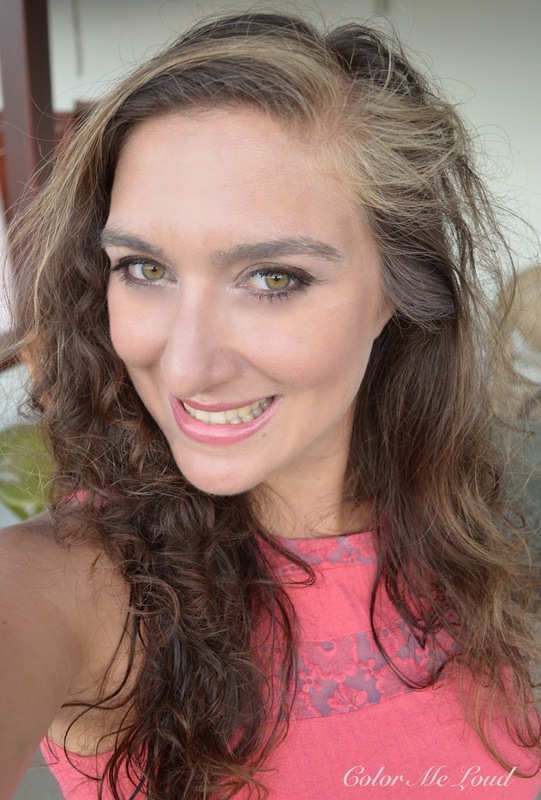 Check out Clare's review on Evanescence Imperceptible Powders too. Final thoughts: I have been using transparent loose finishing powder Diaphanous for over a year now and I can't recommend it enough, especially if you are searching for something which disappears on your face while setting the cream product. 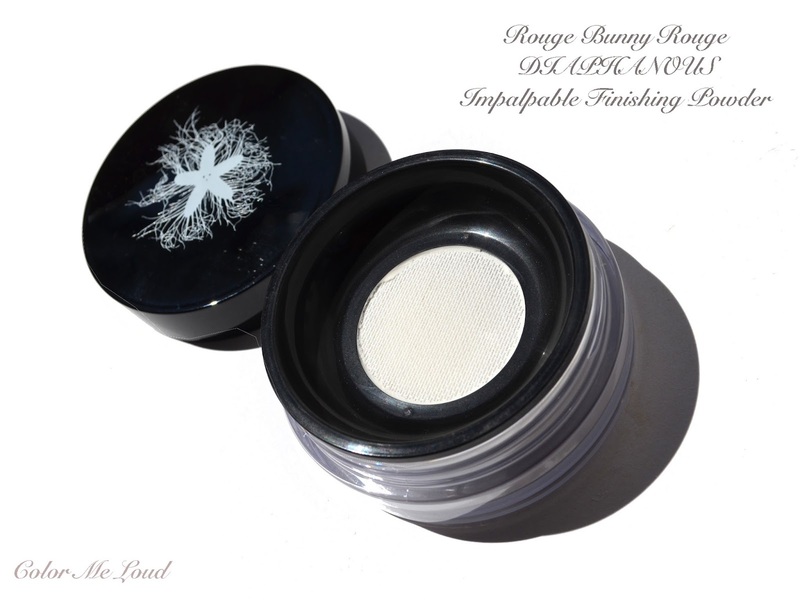 Rouge Bunny Rouge Evanescence powders have a little coverage and a transparent to semi transparent finish. The shades differ in undertone. I am loving #61 Eidola for my natural (now tanned) light to medium complexion. It is great to put tiny bit of coverage on a tinted moisturizer for a natural day makeup. It doesn't look heavy nor cakey on my normal to dry complexion. Thumbs up for the new release. Do you regularly use finishing powders? Do you prefer translucent ones or those with a bit of coverage. Disclosure: The products in this post were provided free of charge for my consideration. OK I can definitely see myself picking up Diaphanous. I'm going through my powders (killed 3 pressed powders already), and don't have many left. I have 2 more pressed (using 1 diligently now) and 1 loose, and once I'm done with them, I'll try this. i LOVE the RBR Diaphanous! It is every bit as amazing as you describe! I recently purchased the TF Powder foundation and I don't love it. I keep trying to love it, but it is just ok. ByTerry Densiliss powder is what I carry in my bag for touchups. I am verrrry happy with it. So smooth and light. Even though the packaging for this one is gorgeous, it is too darn heavy!! Oh well - worth it! So interesting and timely. These look great. I don't usually wear powders, but have been looking into the Laura Mercier brightening powder to set under eye concealer. Are you familiar with that one, Sara? I tried it yesterday in the store and liked the effect. It seems like Diaphanous might have a similar effect. Can it be used near the eyes? I love the look you've posted here...very light and fresh and pretty! I wish I had access to a RBR counter or store; I'm always a little hesitant to buy before I try. I've heard so many great things about the brand. Ohh i really got to try the new compact powder!! I LOVE Diaphanous.... and those are sacs.... just say it Sara... hahahaha. For a moment I confused myself thinking lung...lets?? ROFLL. Btw, I was at my old job for 5.5yrs, and even though I told every company i met to pls just send me digital presentations, and according to my petty colleagues I wasn't doing very much work... i still managed to fill our giant secure disposal box to the brim (by which I meant the ceiling) and the floor! So much for saving the environment! RBR is always so pretty! And yet I've yet to try any. I don't wear powder every day, and when I do it's one of Nars Crystal Translucent (v.sheer), Charlotte Tilbury (a bit heavier, but still skin like) or Chanel Le Beiges B30 (adds glow and a touch of colour too). Currently the last is my jam by day and the Charlotte Tilbury by night! Chanel Powders are also very pretty, It is on my wishlist for so long. It is one of the few powders which doesn't dry my skin out, together with RBR. I have to yet try Nars one. I had so many stuff at work, I threw all of them away. I was like "I don't care about those, where is the waste basket" lol. I must have gotten rid of 80% of all the papers. But visualizing your stuff filled up to the ceiling is fun lol. these are my too humid, too hot, let me put on minimal make-up kind of looks, I am glad you liked it. I haven't been to a RBR Counter yet either. I know it is better if you touch and feel but some of the products are already cult so you might take chances. Oh yes Hourglass ones are pretty, especially for combination skin. On me they are a bit drying, which is an advantage on oily gals, it means it does something to keep that at bay. Hi Alison. I have Laura Mercier Brightening powder for under eye area. I don't know if it i.es because mine got some humidity in but it is not very finely milled on me. I am much better off with Diaphonous to set my under eye concealer. it is a pity that Tom Ford Powder is not love, especially at that price point. I haven't tried it myself yet. Do you have dryish skin too? ByTerry Compacts are to die for but it can be used to kill too, just drop it down over someone's head haha. But still they are so luxurious, love them! I am sure you will love Diaphanous. This is my second can! (is this a can? maybe not but you know what I mean lol). Thanks, I will take a look at that. Was also considering les Beiges. But it seems denser. Thanks for the link :) I really am a fan of the powder, great to find one that is dry skin friendly. I keep meaning to try the loose one, it really just sounds wonderful. Thanks Sara, I am definitely going to check these out. I have the Diaphonous and it's brilliant!